Synopsis: DreamWorks Pictures’ Delivery Man stars Vince Vaughn as affable underachiever David Wozniak, whose anonymous donations to a fertility clinic 20 years earlier resulted in 533 children. David must now embark on a journey that leads him to discover not only his true self but also the father that he could become. When donating sperm, how many women can a man expect to purchase said sperm, and actually have a child? The statistics are out there, somewhere, but when it comes to movies truth is pushed aside for the sake of entertainment; Delivery Man proves such a fact, and it does so with an absolute endearing quality and plenty of heartfelt musings that gets one’s tear ducks flowing. David Wozniak (Vince Vaughn from The Internship) is not a prime specimen on paper–he is a meat truck delivery driver, who always happens to owe a great deal of money to a loan shark–, so the fact that his over-abundance of sperm donations 20 years ago landed him with 533 children is outrageous. A best guess of his popularity could be attributed to his height, or shady business dealings by the sperm clinic…more on that can only be revealed by watching Delivery Man. David signed an agreement with the Sperm Bank wherein he would remain an anonymous sperm donor, his name never to be revealed to any of the women who “purchased” his sperm or the children conceived with it, ever. Thanks to the law, and how a group of over 142 men and women of whom he is the biological father wish to know his identity, a law suit is filed requesting the contract be voided and his identity revealed. His children wish to know who their father is, regardless of how it may impact David’s life. News outlets salivate over a story such as this, and that point is not overlooked in the film. The last thing David needs is such a predicament, with a baby on the way with his on/off again girlfriend Emma (Cobie Smulders from The Avengers), a loan shark threatening violence towards him and his family, and the need to prove his worth to everyone after being a screw up most of his life, even if he is one with a heart of gold. Delivery Man has the overall set-up of a haphazard comedy, especially with leading man Vince Vaughn who made his mark in film with over-the-top, potty-mouth full, immature humor centered movies like DodgeBall, Wedding Crashers and Old School. While his previous work may have been entertaining, and profitable, Vaughn has taken a step away from the immature to show his growth as an actor, and a comedian with Delivery Man. The premise is ridiculous, but that is not the heart of the story, nor should it dismay anyone who thinks the movie is not suited for them. Vaughn’s character David undergoes life-changing situations by developing relationships with his newfound children, and by doing so your heart strings are pulled upon more times than one can count and the abundance of warmth and love that flows throughout the movie is enchanting. The laughs are always present, and Chris Pratt (“Parks & Recreation,” Zero Dark Thirty), the undeniable go-to comedic sidekick, helps matters with his portrayal of baffled lawyer, and father of four, Brett. Delivery Man is not merely about gaining a laugh, it is a great deal more. The movie showcases a man growing, maturing, and becoming the person he wishes to be in a new stage of his life. It also makes sociological and political statements, as it deals with the anonymity of sperm donors and the right to privacy in an age where parenthood is not a simple concept. The surface layer of Delivery Man may appear thin, but the enormity of emotions and overall satisfying nature of the story makes it a movie one should not miss seeing; it is simply that satisfying. Delivery Man is full of mature material, co-mingled with bouts of comedy that form naturally as opposed to directly assaulting the viewer, eliciting a laugh because you have no other choice but to do so. It is because of this method that the comedy is not laugh-out-loud funny, aside from the occasional grand joke. This is not to say the movie is anything short of enjoyable; on the contrary really. Delivery Man succeeds so well because it has the perfect balance of drama and comedy, and an undeniable lightheartedness that warms a viewer. 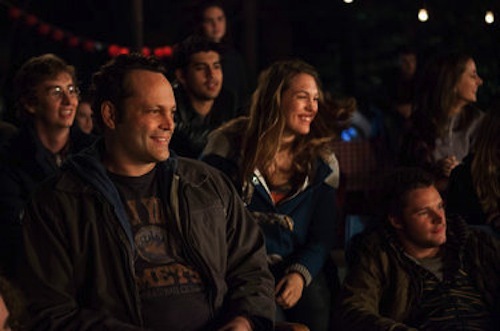 Vince Vaughn is a very funny comedian, with the ability to deliver a joke, but in Delivery Man he also shows that he has range as an actor. There is a dramatic depth to his character David, often unseen in any of his work, and while the jokes may not be as plentiful as one would like they are timely in the plot and never misplaced for the sake of gaining a laugh. Audiences will be hard-pressed to fault Delivery Man for not being funny enough after experiencing the overall experience of watching the movie.